What unites all these lands, besides their tramontane routes, are their Jews, whose ancestors had known all these lands under earlier names and under no names, and had traded with all of their peoples in their own languages. It was this ability to slip between states, endonyms, exonyms, and tongues that enabled the Mountain Jews’ survival—their continuity like rock—and earned them the contempt of countless dynasties that withered. It was also what caused the Nazis to recognize them as Jews, and to treat them accordingly—indeed, they were the most Eastern Jews the Nazis ever encountered and, after studying their customs, not excluding polygamy, it was decided that their Judaism was more “religious” than “racial,” though that didn’t prohibit the occasional massacre. The Soviets, however, in compiling their statistics on national minorities, formally indexed them not as Jews but as Iranians. With the Soviet collapse, Sunni extremists started kidnapping Mountain Jews for ransom in Dagestan and Chechnya (Mountain Jewish communities always pay ransom), so that today, Azerbaijan seems to be their safest haven in the Caucasus—the only country to have realized the benefits of touting its Mountain Jews as mascots of ethnic comity, while shrewdly using them as regional dragomans and trade intercessors with Russia. Because if Azerbaijan has become the Mountain Jews’ sanctuary, Russia is now their bazaar—its appetites have made their fortune. Mountain Jews of my own generation, who came of age under Yeltsin’s two terms of larceny and greed, moved into Moscow, St. Petersburg, and the vast cities of Siberia that have less name recognition, but more manufacturing infrastructure and coal mines. There they went about privatizing. Here’s what privatizing means: When a state that owns everything disintegrates, suddenly everything’s up for grabs; if you want a shop, or a factory, or an entire industry, say, you just show up and claim it as yours; the cops can’t kick you out, because there aren’t any cops—the cops don’t stay cops when they’re not getting paid—and so you dig in, and, should other parties arrive to stake their claims, you just have to hope that you have more and bigger men, and more and bigger guns, than they do. To give two examples—not to accuse them of having done anything like this, but merely to admire them if they had—God Nisanov (b. 1972), and Zarah Iliev (b. 1966). Both moved to Moscow in the early ’90s and immediately went underground, taking over kiosks throughout the drafty cavernous Metro, whose stations had been designed to serve as bomb-shelters, but now were also becoming groceries and malls. Nisanov and Iliev began shipping produce to the capital, setting up construction firms, and investing in real estate. Today, they’re the largest commercial real-estate developers in Moscow, with properties including the Evropeyskiy Shopping Center, the Radisson Royal Hotel, the Radisson Slavyanskaya Hotel, myriad office parks, and wholesale and retail commodity markets (food, appliances, electronics, etc.). As of 2015 Forbes estimated the net worth of each at $4.9 billion, which tied them for the title of twenty-fourth richest person in Russia. In 2014, Nisanov was awarded the Order of Friendship by Putin and was elected to the executive committee of the World Jewish Congress. Both Nisanov and Iliev were born in the most venerable of the Mountain Jewish auls, Quba. Pronounced Guba. Actually, they’re from a Jewish enclave located just outside Quba, which in Azeri is called Qırmızı Qəsəbə, and in Russian is called Yevreiskaya Sloboda (Jewish Town), though under the Soviet period its name was changed to Krasnaya Sloboda (Red Town). Now, it shouldn’t seem particularly strange that a village of fewer than 3,800 people produced two childhood friends who grew up to become billionaires together. But it should seem particularly strange that this village currently boasts four billionaires, and at least twelve (by one count) and eighteen (by another) worth in the hundreds of millions. 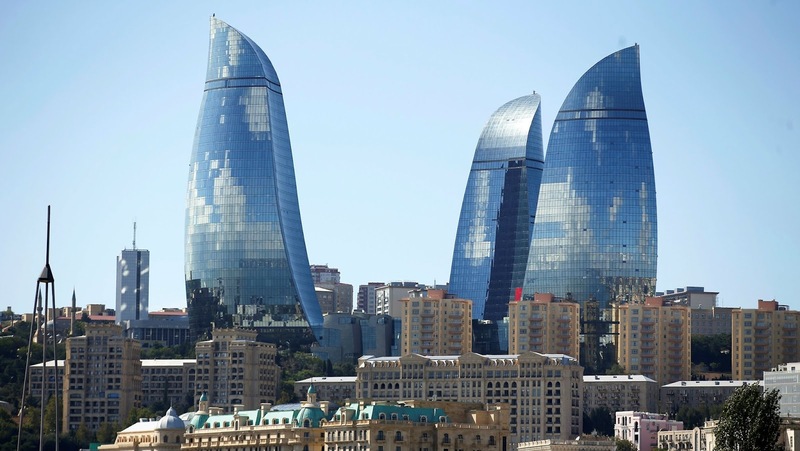 They include, as already noted, major property developers and commodity importers, but also car importers, clothing importers, and the managers of the Azerbaijani government’s oil and gas portfolios. None of this crying poverty was making any sense. Because, as I couldn’t help but notice—as Yury Naftalovich couldn’t help but ignore—cropping up among the old Jewish sites he’d been bringing me and U to, overshadowing all of their carved wood and stained glass and even the six cupolas with their six-pointed stars, was some of the most lavish, most ugly-lavish, new real estate I’d ever been around. I’ll clarify: On the Quba side of the Qudiyalçay were chickens, cows, tractors, and hovels—grimness. But on this side, here in Krasnaya Sloboda, were Lamborghinis, Ferraris, and villas that intermarried craven faux-Euro fin-de-frippery with the crassest of Stateside suburban McMansionism. If every Baroque has its Rococo, every Vegas has its Dubai, but this architecture was so outlandish, it verged on the extraterrestrial—there was nowhere to go beyond it. Some of the villas had five floors, some had six, most had turrets, many had elevators. Fountains in the yards, gargoyles, putti. Guardtowers, spiked fences, CCTV cameras surrounded. One had a helipad on its roof. Another had a rooftop pool. I asked to be taken to Zakharyayev’s—to ask him if he had another of his calendars lying around—but U hesitated to transmit the request, as if he’d forgotten how to speak Gorsky, or Russian, while, at the same time, Yury Naftalovich frowned, as if he were gradually remembering that he understood English after all. I persisted, and asked where God Nisanov’s house was, where Zarah Iliev’s house was, and snap, just like that, my audience with the officious offseason caretaker of the summer homes—at least of the summer vacation destination—of some of Russia’s most wealthy and most powerful men, was over. Yury Naftalovich, that dignified creep with a hedgehog for a moustache, bum-rushed us into the car, and stalked back to the yeshiva—gone. This was one of the most insightful articles I've ever read from Tablet. It's funny how I perceived my fellow Jews in Azerbaijan as free and prosperous because of the tolerant culture of the country. And yet, because of the lasting effects of the Soviet Union, it seems like a statist hell hole for them. I wish that the author hadn't been so critical of religious (in particular Hasidic) practice, because I think he could have gained tremendous insight from the religious aspects of the community. You should call him a nazi and try to ruin his life. "When a state that owns everything disintegrates, suddenly everything’s up for grabs; if you want a shop, or a factory, or an entire industry, say, you just show up and claim it as yours; the cops can’t kick you out, because there aren’t any cops—the cops don’t stay cops when they’re not getting paid—and so you dig in, and, should other parties arrive to stake their claims, you just have to hope that you have more and bigger men, and more and bigger guns, than they do."